Take the essence of good taste and combine it with a flavoring of herbs and, Voila, you have the cute little Herbal Essence Café! This purveyor of contemporary Northwest cuisine is tucked into a historic brick building right downtown. A friendly lunch and dinner spot, this is on the regular list for the surrounding office dwellers and concert attendees. 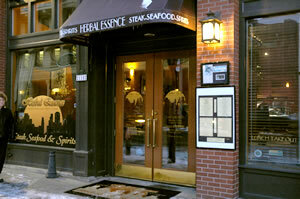 Serving up steak, seafood and spirits it continually raises the spirits of those who partake. Lunch includes such treats as sandwiches, wraps and salads. These common items move into the indulgence category when they become the unique Smashed Sub, Kobe Beef Burger or the Gorgonzola Chicken Wrap. Be assured that there are good, more common Rubens and Turkey sandwiches offered too. Or maybe the Half-Baked Sub and Soup De Jour is more up your alley. Salads are fresh, herbal tasty and innovative. Smaller plate grilled entrees are available as luncheon fare. A popular café for the pre-symphony crowd, dinner is a delightful blend of steak, seafood, chicken and tofu delights. A pastry wrapped baked Brie is the favorite appetizer among several other first plates. Seafood entrée’s feature Potato Crusted Halibut, Seafood Baked Salmon and Dungeness Crab Cakes among others. Gorgonzola Topped Sirloin, Seafood Stuffed Rib Eye and Prime Rib on Fri and Sat nights are always popular. Roasted Lamb and Pork loins also have an Herbal presentation. A revolving seasonal specialty is the preparation of wild game dishes. Expect to find at least one version of venison, elk, quail or pheasant on the menu. Is buffalo wild any more? 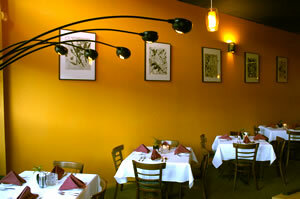 All Entrees are served with your choice of Herbal Essence's award winning house salad, Caesar salad or clam chowder. 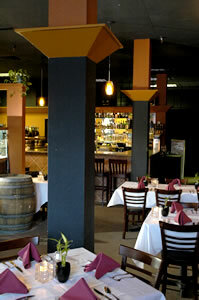 A nice wine list compliments the entrees and don’t forget to round out the evening with desert. All of this is warmly served up in a cozy yellow-walled space over seen by a large salt-water aquarium. The knowledgeable staff is friendly and waiting to serve you. Herbal Essence requests your dining presence!